On Tuesday afternoon she skipped her usual foul language and began praying. 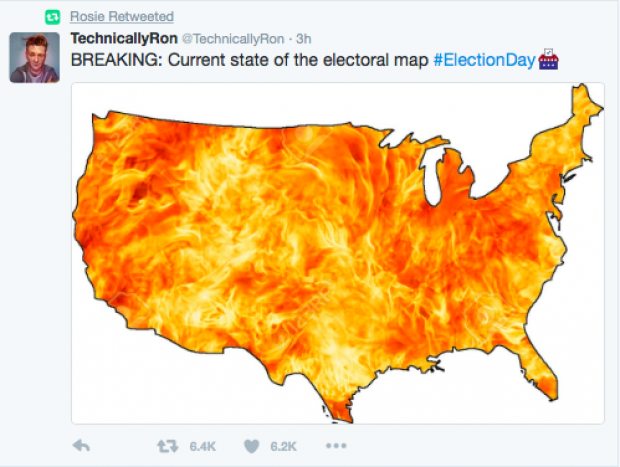 Tonight she’s retweeting a map of the U.S. in ball of hellish fire. What else is on Rosie’s mind? She’s retweeting a woman who is clutching her children and watching a family documentary on TV. And she’s counseling a Twitter friend on whether it’s okay for a toddler to have an imaginary friend. 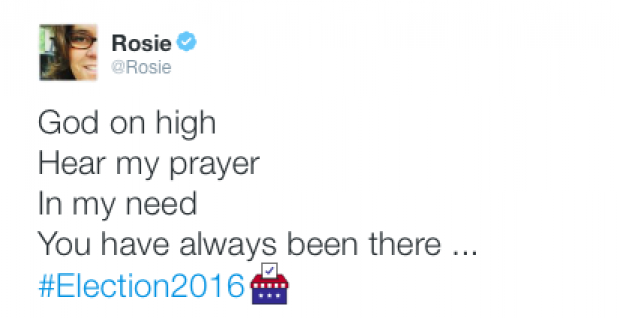 It’s unclear what Rosie will actually do if Trump wins. The last time Trump spoke formally about O’Donnell was at the recent Al Smith dinner. Somehow the feeling isn’t mutual.